The Cheops mission, ESA’s first mission dedicated to the study of exoplanets, is scheduled to lift off on a Soyuz rocket from Europe’s Spaceport in Kourou, French Guiana, within the launch slot 15 October – 14 November 2019. 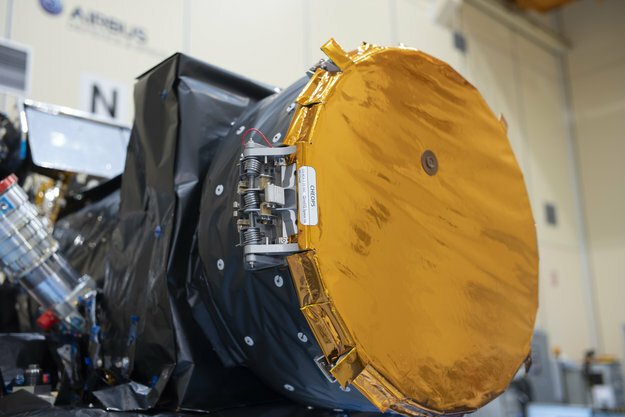 Media representatives are invited to apply for accreditation to visit the spacecraft, which is in the clean rooms of Airbus in Madrid, on 29 March, before it goes into storage ahead of its shipment to Kourou later this year. 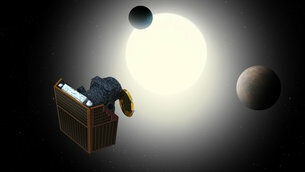 The satellite will observe bright stars that are known to host exoplanets, in particular those in the Earth-to-Neptune size range. By targeting known planets, Cheops can plan exactly where in the sky to point and when to catch the exoplanet as it transits across the disk of its host star. Its ability to observe multiple transits of each planet will enable scientists to achieve the high-precision transit signatures that are needed to measure the sizes of planets in this range. The combination of the precise sizes determined by Cheops with masses determined from other measurements will be used to establish the bulk density of the planets, placing constraints on their composition. These data, together with information on the host stars and the planet orbits, will provide key insight into the formation and evolutionary history of planets larger than Earth and smaller than Neptune. Cheops is an ESA mission implemented in partnership with Switzerland and a number of other Member States including Spain. Experts will present the mission, its technical challenges and scientific goals during a dedicated programme for media at Airbus. The spacecraft will be visible through a large window. Because of safety regulations only few TV broadcasters will be allowed into the cleanroom. The event will be conducted in English language. Media with valid press credentials should write to espacio@airbus.com by 27 March to register. Social media participants should check here that they meet the eligibility criteria before applying. Note that there is no dedicated social media event; those attending with social media accreditation will have the same access to the event as traditional/online news media. There are a limited number of places for social media participants; successful applicants will be informed by 25 March. For live updates throughout the event, follow @ESA_CHEOPS, @esascience and @esa on Twitter, as well as facebook.com/EuropeanSpaceAgency, instagram.com/europeanspaceagency and youtube.com/user/esa; follow for extra content and a unique take on the mission. Click here for the latest Cheops images and videos.